If you want to keep your head, don't let the Dark Queen catch you sneaking around the new Fantasy Artists of Etsy exhibition! 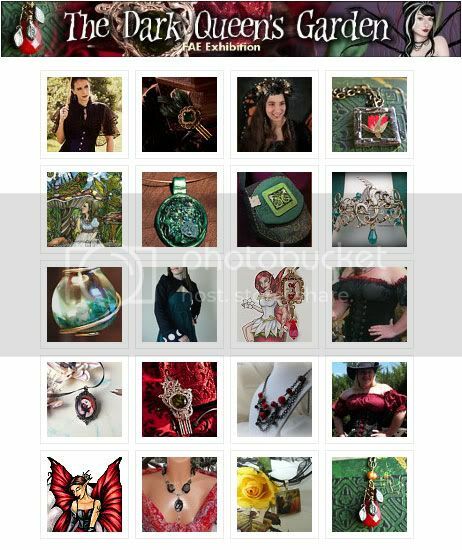 The Etsy Mini below is just a glimpse at the dark art, gothic jewelry and costume accessories that she's entrapped in her glorious garden. EDIT: The Dark Queen's Garden has been replaced by another exhibition, but click on the screenshot below to view all the FAE items currently for sale that are tagged with the word "queen." Enchanting! Your fae fit right in.